Rate this project Maximilian Gerhard has announced the release of KANOTIX 2011-05, a Debian-based desktop distribution and live DVD featuring the KDE desktop: "LinuxTag 2011 in Berlin started today, therefore we offer an updated KANOTIX 'Hellfire' version. Kanotix 'Hellfire' 2011-05 is based on Debian 6.0. It contains the latest Debian stable branch with all the latest security updates. In addition it provides useful extras and updated packages, including: Linux kernel 2.6.38 final (Ubuntu, recompiled), KDE SC 4.4.5 with KANOTIX branding, Amarok 2.4.0, LibreOffice 3.3.2, GRUB 2 boot manager, KDE Network Manager, Iceweasel 4.0.1, Icedove 3.1.9, Pidgin 2.7.11, NTFS-3G 2011.1.15, WINE 1.3.19, Kano's scripts for installing NVIDIA or ATI graphics driver and Flash Player plugin." Here is the full release announcement. 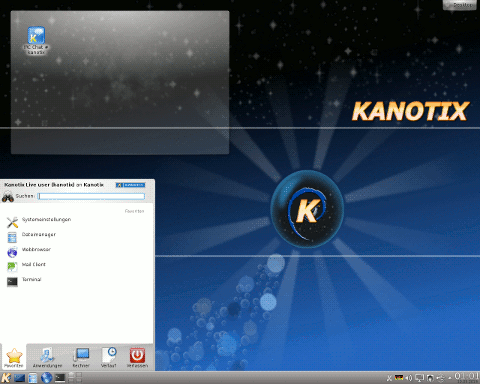 Download: kanotix-2.6.38.iso (1,258MB, MD5), kanotix64-2.6.38.iso (1,381MB, MD5).